Board Member Christine Strehle with her sister Kathy Ann Murray at the 2006 NYC Marathon. Board Member Christine Strehle will be running as a part of HeartShare’s Marathon team. 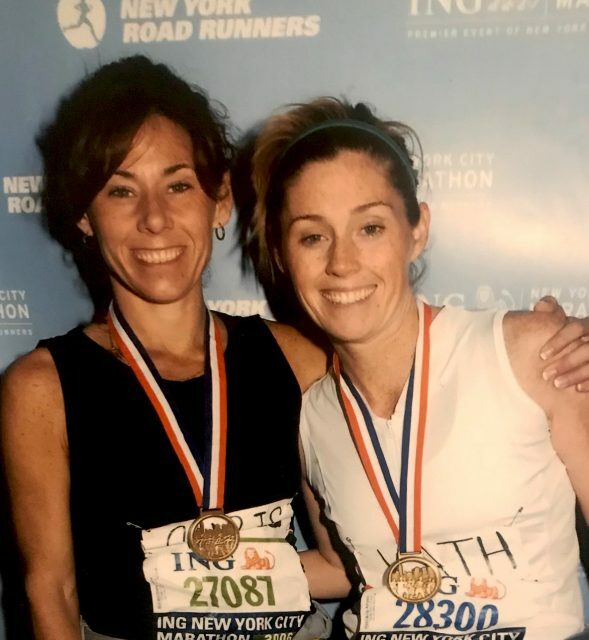 Strehle first ran the NYC Marathon with her sister Kathy Ann Murray in 2006. “I’ve been contemplating it for a couple years and it’s something that I’ve wanted to conquer again. When I learned that HeartShare was forming a team, I knew I had to do it,” Strehle said. “It’s about setting high expectations for yourself that are not only positive for your health, but also giving back,” she explained. Since childhood, Christine’s life and HeartShare have been intertwined. She inherited this tradition of giving from her late father, Jimmy Buckley, Sr., a former HeartShare Board Member and namesake of the Buckley’s-Kennedy’s 5K Charity Run. “The Buckley’s Run has been on the 3rd Sunday in May for as long as I can remember,” Christine said. As a Board Member herself today, Christine fondly recalls being a part of barbeques and family dinners at the HeartShare residence named after her father–Buckley’s Residence in Canarsie, Brooklyn. Christine also was proud to be a part of this community when the playground was built at The HeartShare School. Strehle is not only an active Board Member and business woman overseeing both Buckley’s and Kennedy’s Restaurants, but also an active community volunteer and mom of 6. “By running the Marathon, I hope to set a good example for my children. It’s about taking a goal that appears unreachable and being determined to achieve it,” Christine said. In 2014, Courier Life Publications and Community Newspaper Group honored Christine as a “Woman of Distinction,” an award for 25 of the borough’s best and brightest. Strehle typically trains running a loop across the Gil Hodges Bridge and along the boardwalk in the Rockaways. Her brother Jimmy Buckley and her nephew, Jimmy Buckley, Jr. will also be running the NYC Marathon this year. Although she is running for HeartShare, Strehle also wants to dedicate her run to her late friend Pam Collins, who sadly passed away at age 48. “Pam ran the Marathon once and she always talked about that accomplishment with great pride. I will be running with Pam in my heart,” Strehle said. Click here to donate to Christine’s page.